Blackie helps him say his prayers. Joey Jacobs as "Little Pal" Martin Wilmerding Jr.
Boston Blackie, a dapper crook, and his accomplice, Mary, plan to rob the Wilmerding mansion. Mary has been hired as a nurse to Martin Wilmerding Jr., and after Mrs. Wilmerding has gone to a ball, Mary lets Blackie in and he starts to open the safe. However, Blackie is interrupted by Martin Jr. (his little pal), who has been awakened from his slumbers. Blackie gently orders the kid to return to bed, but Jr. refuses to do so unless Blackie helps him say his prayers. Thus is formed a strong friendship between Blackie and his "little pal." Mrs. Wilmerding returns from the ball with her lover, Donald Lavalle, and when Blackie overhears their plans to elope together with her jewels, he tricks Donald into giving him the jewels by posing as the jealous husband. Through several telegrams, he effects the reconciliation of his little pal's parents but cannot decide whether or not to return the jewels. Shortly before the end of the picture, a subtitle appears on-screen, asking the audience if Blackie should return his stolen jewels and go straight. Though not a new device, this "Lady or the Tiger" gimmick provided an extra laugh to this already entertaining escapade. 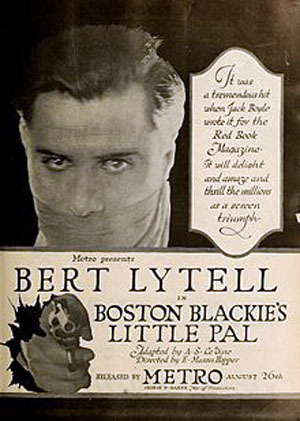 Bert Lytell has a star on the Walk of Fame in the Motion Pictures Category. The address is 6439 Hollywood Blvd, between Cahuenga and Wilcox, north side, GPS 34.101725,-118.330174.